Visitors to ZSL London Zoo will be able to experience a brand new, festive themed illuminated trail from 22 November 2018 – 1 January 2019. The world-famous attraction will be transformed this Christmas with its very own fantastic after-dark experience created in partnership with Raymond Gubbay Limited and designed by Culture Creative, the team behind ‘Christmas at Kew’. Shimmering with seasonal sparkle, the outdoor festive trail will offer something for everyone as visitors follow a mile-long path through ZSL London Zoo scattered with twinkling lights. Greeted by festive sights and sounds, visitors will wander amongst seasonal colour and through glistening tunnels of light. With the animals tucked up in bed, visitors will be able to explore for the first time the ZSL London Zoo trail where fairy-tale meets fantasy and larger-than-life pea-lit wild animal sculptures rise into the night sky. Visitors will be surrounded by sparkle as the pathway leads them through the Light Vortex and into contrasting tunnels, some delicate and some spectacular, festooned by a canopy of over 100,000 glistening pea-lights. Walk beneath playful ribbons of colour-changing lights and listen for the mesmerising voices of Singing Trees in the distance. 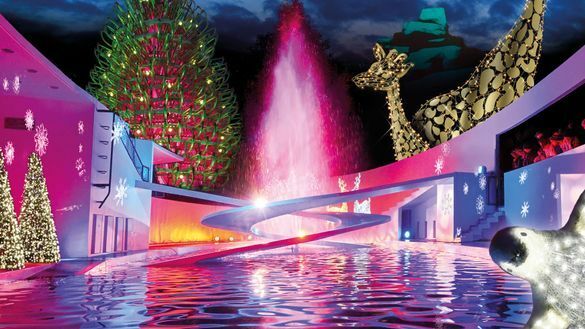 Discover the glowing fountains as the iconic penguin pool dances in time to much-loved Christmas classics. Pause for a while at the historic Mappin Terraces as the Magic Mountain springs to life with a blast of colour and playful projections. Keep a watchful eye out for Father Christmas and his elves along the way. There are plenty of hidden surprises too – watch out for frosty snowflakes, shimmering stars and gigantic baubles where you least expect them. Not so hidden will be the 11-metre-tall Sledge Tree, made from 365 illuminated wooden sledges! Complete your stroll under the stars with mulled wine or hot chocolate whilst the aroma of roasting chestnuts fills the air. Soak up the atmosphere with a vintage carousel ride*, and other family rides whilst you enjoy traditional treats, before picking up an irresistible gift or two at ZSL London Zoo’s shop. When: 22 November – 1 January 2019 The festive trail is open on selected dates. Admission: Advance prices from: Adult £16.50, Child £10.50, Family £52.00, Under 3’s & carers free. Price discounts for ZSL members. Transaction charges apply. Please note: Christmas at London Zoo is a unique opportunity to experience a magical series of twinkling light installations in the Zoo after dark on a festive trail around ZSL’s historic London site. The trail takes place in the evening, past the Zoo residents’ bedtimes. Instead the light sculptures will circle the Zoo’s 36 acre site, making sure not to disturb any of the sleeping animals.